The Mayor of London, Boris Johnson, today confirmed he will go ahead with his proposed "Crossrail for Bikes" Cycle Superhighways across central London, following one of the largest public consultations in the history of Transport for London. The East / West Cycle Superhighway will form Europe's longest substantially segregated urban cycleway, stretching from Tower Hill in the east to Acton in the west. 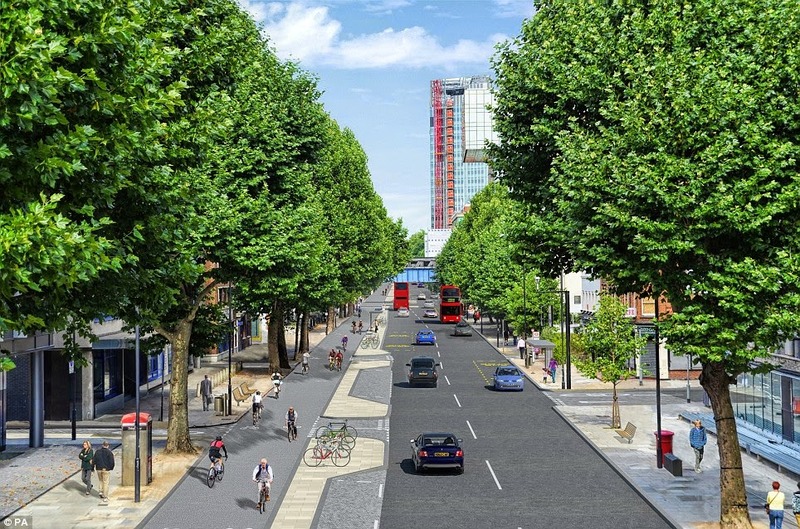 Intersecting with a new North / South Cycle Superhighway from King's Cross to Elephant and Castle, the new routes will form the flagship facility in Johnson's £913million 10-year cycle investment plan. Boris Johnson rides the route of his future Cycle Superhighway on the Embankment with Olympic champion cyclist and campaigner Chris Boardman. Photo via Press Association with thanks. The Mayor said: “We have done one of the biggest consultation exercises in TfL’s history. We have listened, and now we will act. Overwhelmingly, Londoners wanted these routes, and wanted them delivered to the high standard we promised. I intend to keep that promise." The nine-week public consultation on the plans saw an overwhelming 21,500 responses from individuals and business organisations, with 84% in overall support of the plans. A YouGov opinion poll taken during the consultation found 73% of Londoners supported the Cycle Superhighways, even if it meant taking a lane of traffic away. Coordinated by pop-up campaigning group CyclingWorks.London, over 170 businesses and organisations pledged their support for the Cycle Superhighways and called on the Mayor to construct them without delay, including key employers along the route such as Unilever, Orange, the Royal Bank of Scotland and Deloitte. The original route along the Embankment, which will still incorporate Parliament Square, subject to modifications. The original plans from Transport for London have been revised in response to concerns by the City of London, the taxi lobby and the Canary Wharf Group that building cycle tracks would cause too great a delay. The lanes for other traffic on the Victoria Embankment were to be cut from two to three between the pinch points of Blackfriars underpass and Temple Station. By squeezing the cycle tracks at these points, the three lanes of traffic will be able to remain. The Mayor's Cycling Commissioner, Andrew Gilligan, believes delays will be cut by 60% on the original plans. The worst affected journey - from Limehouse Link to Hyde Park Corner - will now only take an additional 6 minutes, rather than 16 minutes under the original plans. The traffic models do not account for people switching to other types of journey (ie cycling) as Rachel Aldred explains in her blog about why we should not fear the worst case scenario. These new routes will fundamentally change London. Currently we stand with our back to the Thames and the Embankment. What is currently a traffic-choked, noisy and dirty rat-run for the city will become the spine of London's safest cycling infrastructure, where cyclists of all ages and abilities - from roadies, to children - will be able to undertake their journeys in safety. Transport for London's rendering of the north / south Cycle Superhighway from King's Cross to Elephant and Castle. “Cycling is clearly now a major transport option in London, with over 170,000 bike journeys now made across central London every single day... These projects will help transform cycling in London – making it safer and an option that more and more people can enjoy." We should be clear that the Cycle Superhighway plans are not perfect: the width of the tracks being reduced to approximately 3 metres through the Blackfriars Underpass and at other pinch points on the Embankment is very much of concern. Once built they must be monitored, and potentially dangerous sections must re-assessed. Furthermore, the route through the Royal Parks is still not clear and will be consulted on at a later date, as explained by Danny over at Cyclists in the City. Could the Royal Parks put a spoke in the wheel of the whole scheme? And there's no guarantee that the Canary Wharf Group will back down in their opposition to the Cycle Superhighway plans, despite the reduction in delays. You'll remember they employed a professional lobbyist, distributed an anonymous briefing paper full of dodgy statistics, and badgered politicians at party conferences over the scheme. The Canary Wharf Group's Finance Director is one Mr Peter Anderson. He's also Chair of Transport for London's Finance and Policy Committee and a member of their board - and therefore will have a say next week over whether the plans will go ahead or not. The City and Canary Wharf Group have always been keen to demonstrate that opinion is divided on these schemes, whereas it has been my impression throughout that the majority of Londoners want these changes, they need these changes and they must be allowed to go ahead. Those who oppose these changes would do well to remember we are talking about a tiny fraction of London's streets, even though it could have a transformative effect for cyclists. Johnson has now made a big promise in the run up to the elections, it is important that he sticks to it. If all goes well - and not withstanding skullduggery and backroom dealing - London has achieved something incredible with this announcement. It was only a few years ago, in November 2011, that Danny Williams from Cyclists In The City and I organised the Tour du Danger an initial protest around London's most dangerous junctions for cyclists. Since then there have been countless campaigns, protest rides (not least at Blackfriars Bridge) and of course, cyclist's deaths. 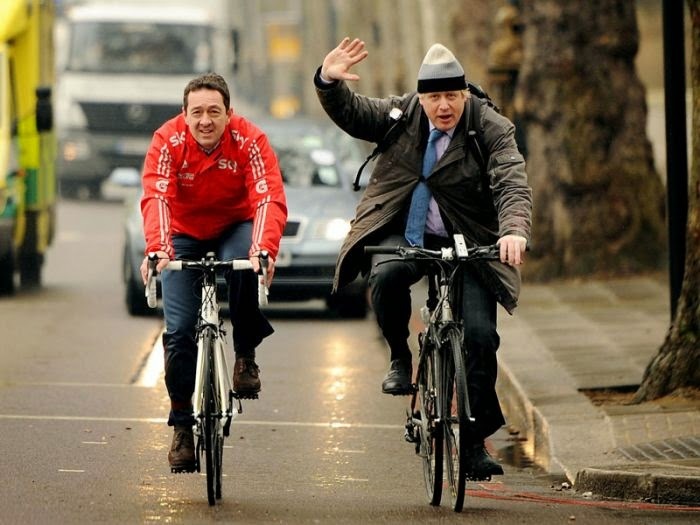 Now we have a major UK politician staking their reputation on their cycling dream, prepared to put up the cash, and even ready to take roadspace away from other traffic to achieve their aims. This is in no part is down to all of you who've badgered your politicians, signed petitions, come on protests and responded to consultations. Give yourself a pat on the back, London. Let's make a date in our diaries for a celebratory ride on our city's beautiful new cycling infrastructure, coming soon to a road near you! Cabbies look like they're going to ask for a judicial review of the CSH. Presumbaly they'd prefer it to go south of the river, on the grounds that no cabs ever go there? Nick, this is the funniest comment we have had on the blog for a very long time. Thank you. Your Blue Peter badge is in the post. as usual, cyclists are expected to go well out of their way to get from A to B via C, D and even G. What's with the massive back tracking dog leg?